Recommended from age of 7 years. Maximum range - about 18-22 yd (around 20m). Dimensions - 9⅝″ x 8½″ (24,5 x 21, 5cm). Material: 3 layers European birch plywood ⅛″ thick (3mm). 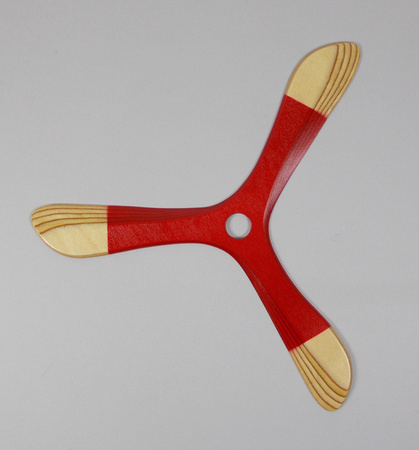 One of our six boomerangs designed by my friend Krzysztof Pietrzak – sport boomerangs promoter in Poland. It was designed by Krzysztof around year 2002. Successfully reproduced by us since 2010. Yeti is a perfect "backyard boomerang". It’s not very demanding when it comes to find the right place to throw. Light boomerang, at the same time simple and ingenious design, low range and a perfect, precise return. It does not require much force. I recommend it for the begginers and for the kids. There is no stress with this boomerang – it’s just fun, fun, fun ! "This model is an improved version of the Wilk boomerang. Now it’s more stable and predictably, it’s easy to bring it in rotation. I use it to TrickCatch. It withstands any modifications such as wing loading, or rubber band on the wind. The hole in the middle is rather a cosmetic. If you want to have fun with modification, try load two wings with one cent coins, and on the the third side airbrake made of the adhesive tape (like low wall to a height of 2-3 mm, width 15 mm). Weighting is best done in the middle or a little further towards the end of wings." Hand made, painted in its multicolor unique painting. Material: 3 layers birch plywood ⅛″ thick (3mm).